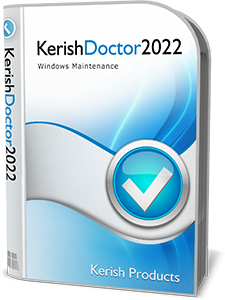 Kerish Doctor 2019 is an integrated solution for computer maintenance that utilizes the most promising developments in this area. Due to its unique system, Kerish Doctor 2019 prevents Windows crashes in real time and also safely fixes registry errors and is suitable for beginners and experienced users alike. The application regularly performs a maximally thorough and safe cleaning of your system to eliminate accumulated digital "trash", thereby increasing the efficiency of your computer in the best way possible. Kerish Doctor 2019 protects your PC against malware and potential vulnerabilities and monitors computer settings that are important from the point of view of security. The Smart Update system promptly updates the application's databases, which are constantly being improved by our experts. Thanks to this system, the software suite is becoming more effective every day, making our solution the most promising in its class. I would Like to thank Kerish Products General Manager for sponsoring 50 unique license keys for this Promo2day giveaway campaign. Validity of Licenses: 1 year (expiration date of keys: March 29, 2020) can be used only on one PC (any count of OS, reinstalling OS does not affect the license and can be activated again) Home/Personal use only. Lost giveaway license keys can not be restored by the developer. Submitting of the license key in the public domain may lead to license blocking without providing a replacement. Mass activations of license key on several devices (more than one PC) may lead to license blocking without providing a replacement. Winners will be selected February 10, 2019. 1. Add a share link of this giveaway (on social media or other forums) if possible. 2. Reply below with a feature you like about Kerish Doctor 2019. 3. (optional) Subscribe to our newsletter RSS FeedBurner and get all the latest giveaways and contests delivered to you by email. 4. Winners will be selected by using Randm.org. and Mike will send the licenses directly to you private message once the giveaway ends. Thanks for the giveaway, I like the unique error detection and cleaning technologies, very smooth after installed Kerish Doctor. Without a doubt my favorite feature is the Destroy function added to the right-click menu. I know other programs delete and clean, but when I want to make SURE, I go to the Doctor. That said, I have used KD in the past on an almost daily basis. My most favorite part is The Intelligent PC scan. Thanks for this giveaway. I used it 2 years and I was very satisfied with it. I hope I win a license. Current time: 04-19-2019 , 01:43 AM Powered By MyBB, © 2002-2019 MyBB Group.